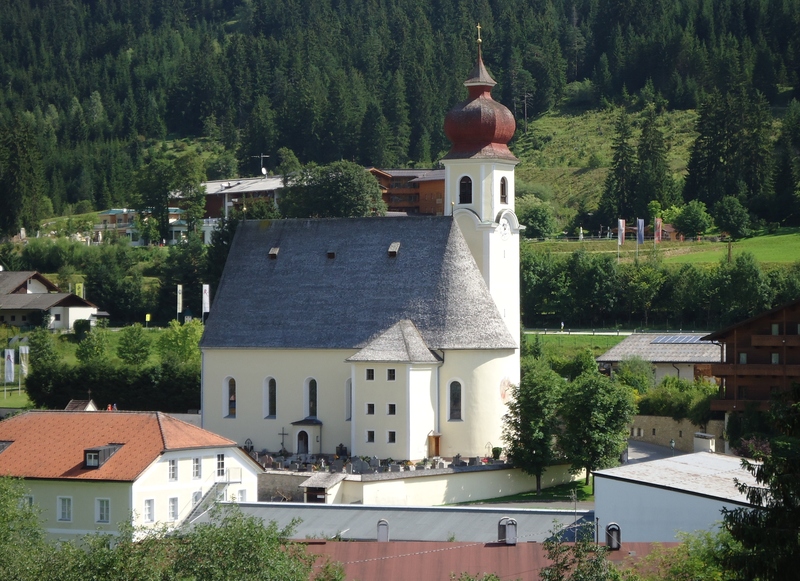 Achenkirche, Austria. A place where I found it easy to worship and rest. This is the second week in our month-long reflection on the relationship between our faith and ‘giving’. Last week we started with the big one, and talked about giving our money. This week should be much easier. We’re talking about giving our time and our talents. Much, much less challenging. Or is it? Commonly, a sermon about giving time and talents would draw on either ‘the parable of the talents,’ from the gospel according to Matthew (25:14-30), or Paul’s first letter to the Corinthians, in which he tells them: ‘Now there are varieties of gifts, but the same Spirit; and there are varieties of services, but the same Lord; and there are varieties of activities, but it is the same God who activates all of them in everyone.’ (1 Cor 12:4-7) But those aren’t the passages I want us to think about this morning. I don’t even want us to think particularly about our talents. Two of the Bible passages we heard today are related to talents; to the way in which our action in the name of Christ can sometimes be a gift greater than our silver and gold, as Peter’s healing was to the man lame from birth (Acts 3:6); and the way in which what we do reflects who we truly are, because the good person out of the good treasure of the heart produces good (Luke 6:43-45) – and I’ll leave you to ponder them yourselves. In this week of focusing on time and talents, I instead want to talk about time. Today’s reading from the Hebrew Scriptures is the beginning of a passage about Jewish festivals, and when and where they’re to be celebrated. The first one mentioned is the one that occurs every single week, in every Jewish settlement – the Sabbath. Keeping the Sabbath is commanded in both versions of the Ten Commandments and given a difference justification in each. In the list of commandments in Exodus, the people are told to keep the Sabbath because: ‘in six days the Lord made heaven and earth, the sea, and all that is in them, but rested the seventh day; therefore the Lord blessed the Sabbath day and consecrated it.’ (Exodus 20:8-11) Keeping Sabbath is about imitating God and recognising that the crown of creation is not humanity, made on the sixth day, but the Sabbath, which God blessed. In the list of commandments given in Deuteronomy, the people are to keep the Sabbath in order to ‘Remember that you were a slave in the land of Egypt, and the Lord your God brought you out from there with a mighty hand and an outstretched arm.’ (Deuteronomy 5:12-15) Slaves don’t get a day of rest; free people do; and the people of Israel have been freed by God. Both versions of the commandment insist that everyone is to celebrate the Sabbath: you, your son and your daughter, your male and female slave, your ox and your donkey, and any of your livestock, and the resident alien in your towns. Everyone is to rest from work: in imitation of God; in celebration of creation; and to remember the exodus from Egypt. While the people of Israel celebrated on the seventh day, the first Christians gathered to share a meal and to worship on the first (or the eighth) day of the week, Sunday, the day of the resurrection and new creation. At first Jewish Christians also celebrated the Sabbath on Saturday but gradually that practice died out, and in 391 the emperor Constantine declared Sunday to be the empire’s official day of rest. For centuries legislation ensured that everyone in the Western world had a compulsory rest on Sunday, whatever their faith. That wasn’t necessarily a good thing. It could be a day of rules and restrictions; a day for fulfilling occasionally-onerous religious obligations; a day without play. That might be part of the reason we don’t have an official day of rest anymore. Could we reclaim it today? Practicing Sabbath might remind us that just as our money and possessions are gifts of God, so is our time. Giving up a certain amount of time to not working, no matter how much we think we have to do, would also remind us that it’s God who created the world, brings liberty to the captives, and overcomes the powers of death – not us. One of the people who have written about the Sabbath, Dorothy C. Bass, argues that ‘to act as if the world cannot get along without our work for one day in seven is a startling display of pride that denies the sufficiency of our generous Maker.’ Sabbath might help us overcome the common heresy that we humans and what we do are the most important things in the world. What would keeping Sabbath look like? According to Dorothy Bass: ‘A Sabbath lasts all day, not just for an hour or two of corporate worship. In the practice of keeping Sabbath, concrete activities (or non-activities) become elements within a faithful way of life. Sabbath observers practice stepping off the treadmill of working and spending. They develop the capacity to disengage from consumer culture and to coexist in gratitude with nature and other people within the plenty of God’s creation and anticipate the future God intends for the world.’ She points out that: ‘Within the complexities of contemporary culture, no specific plan will be accessible to all, and it will be important not to turn the Sabbath into a day that reeks of condemnation rather than gift, as has sometimes occurred.’ Another practitioner of Sabbath, Lynne M. Baab, writes that there are: ‘a variety of possible ways to draw near to God on one’s day of rest. I have heard people talk about their joy on the Sabbath as they walk in nature, pray thankfulness prayers, practice mindfulness, or spend time with children.’ Bass suggests that the most important thing to appreciate on the Sabbath is ‘joyful worship that restores us to communion with the risen Christ and our fellow members of his body, the church’. She then writes that: ‘After worship, what many of us need most is time with loved ones – not useful time, for planning next week’s schedules, but time “wasted” on the pleasure of being together, perhaps while sharing our enjoyment of art, nature, or athletics. For others, and for all of us at certain points in our lives, hours of solitude beckon, hours for sleep, reading, reflection, walking, and prayer. In addition, we might explore the long tradition of visiting the homebound or inviting lonely ones to our table on the Christian Sabbath, when the joy these occasions bring can be experienced apart from the pressures of other appointments.’ What Sabbath looks like would be different for different people, but in all the different ways it’s practiced, Sabbath would acknowledge that our time is a gift of God. Keeping Sabbath seems, according to those who do it, to create more time in the rest of the week. They find they get more done during the week if they have a day of rest. They find that they can ‘work like a demon the other six days’ (Taylor) as long as they knew the seventh was coming. And they can rightly give more of their time to working for God, while knowing that ‘the world does not depend on their own capacity for ceaseless work and is not under their control.’ (Bass) I’m talking about us taking time for a weekly Sabbath as part of a month of giving, because those who try it say that when observing the Sabbath we have more time to give. Sunday as a day of worship and rest is no longer kept free for Christians, and claiming it as that might take effort and sacrifice. It’s hard today to tell an employer or school or sports team that we can’t do something on a Sunday because that’s our day for worship and rest. And given the modern economy, it might be completely impossible for some people to practice Sabbath on a Sunday. Ministers, priests, and pastors know that – for all of us Sunday is a working day. But ministers all know, at least in theory, that when one works on Sunday one needs to find another day for Sabbath, and so ministers might be able to provide an example to other Sunday workers. Ministers are as bad as any other group of people at practicing Sabbath. As Barbara Brown Taylor, who does practice Sabbath, writes: ‘Most of us are so sold on speed, so invested in productivity, so convinced that multi-tasking is the way of life that stopping for one whole day can feel at first like a kind of death’. Barbara Brown Taylor is an American Episcopal priest, professor and theologian. If she initially found practicing Sabbath hard, there’s every excuse for the rest of us to struggle! Yet as Christians, maybe we’re called to slow down, sit down, take time out, and do less. Dorothy Bass writes: ‘What time-stressed contemporary people most need is not more time but time of a different quality, time that is beyond price, time that has shape and substance, time that need not be wrestled with each day as if it were an enemy, time that is the habitation of blessing. This kind of time is available, even in the age of the clock and the Internet, in the practice of keeping Sabbath.’ On this second of our ‘giving’ Sundays, I do want to encourage you to give time to God in the service of God’s creation, but I suggest that you start that by taking time, taking the time to rest and enjoy and worship and remember God the creator and liberator. In the pondering and thinking about how we can live as Christian givers that I hope this month will prompt, I invite you to ponder the words of today’s reading from the Hebrew Scriptures: ‘For six days shall work be done; but the seventh day is a Sabbath of complete rest, a holy convocation; you shall do no work: it is a Sabbath to the Lord throughout your settlements.’ See where these words lead you. Amen. Lynne M. Baab, ‘Stopping: The Gift of the Sabbath’ Congregations (Summer 2005) pp. 28-30. Dorothy C. Bass, ‘Christian Formation in and for Sabbath Rest’ Interpretation (January 2005) pp. 25- 37. Dorothy C. Bass, ‘Keeping Sabbath’ in Practicing our Faith (San Francisco: Jossey Bass, 1997) pp. 75-89. Barbara Brown Taylor, ‘Sabbath resistance’ Christian Century (May 31, 2005) p. 35. This entry was posted in Sermons and tagged giving, sabbath, Sermon, time. Bookmark the permalink.